For this country’s best pike fishing in protected waters come to the Swedish archipelago closest to the continent in Blekinge Province. Live in comfort in modern cabins and fish from safe boats with new (Tohatsu 9,8 hp), 4-stroke motors. It’s a four-hour drive from Germany and three from Denmark. All guests get current fish info with tips on the best sites depending on the weather. At Svalemåla Sports Fishing & Conference we speak Swedish and English and understand German and Danish. We are open March - October. The best fishing for pike is September - November and March - May. We have bicycles and kayaks. There are hiking trails of varying length and difficulty and the Bräkneleden Cycling Trail passes the Svalemåla Cabin Village. 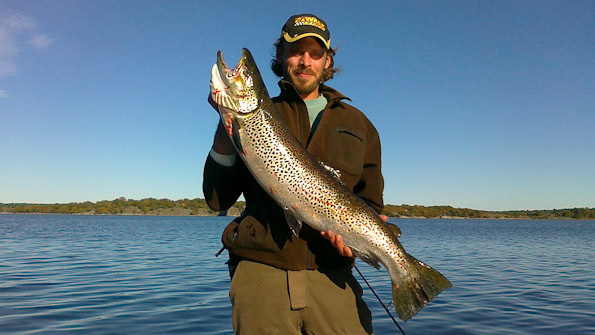 We welcome all anglers to the beautiful coast of Blekinge and Svalemåla. Here you can fish for pike, perch, cod, brown trout and herring. Many pikes exceed 100 cm. We have twelve plastic 4.20 – 4.40 m boats with 10 hp 4-stroke motors (Tohatsu), and one Uttern 4.35 m boat with 20 hp 4-stroke motor. All boats have Tohastu motors, anchors, life jackets, oars and sea charts with the best fishingspots marked. In Svalemåla most everyone fishes pike with jerk bait or wobbler, though fly-fishing is possible. During the winter, spring and autumn seasons the pikes are found in the coves, while from June-August they migrate to deeper waters depending on the temperature. All guests use C&R for pike, though if you wish to catch fish to eat you can jig for cod in deeper water only 15 minutes from the dock. Pike: min 40 cm / max 75 cm; max three/day, but most everyone uses C&R. Cod: min 38 cm. Salmon and brown trout: min 40 cm; off-limits Sept 15 - December 31. All six 6-person cabins are around 45 sq.m. They have a loft at both ends and six beds – a double in the ground-floor bedroom and a double on each loft. The kitchen has refrigerator/freezer, stove/oven and microwave, dishwasher, coffee maker and utensils for six. The living room has TV, kitchen furniture and a corner sofa. The four 4-person cabins are around 35 sq.m. in size. This smaller cabin has one loft with a double bed and the ground-floor bedroom has a bunk-bed where the lower bed is extra large. The living room has a combi-kitchen with a sink, oven and refrigerator/freezer, coffee maker, kitchen furniture, TV and utensils for four. There are bathrooms with WC/shower in all cabins, as well as a parking place and a terrace with outdoor furniture and a grill. 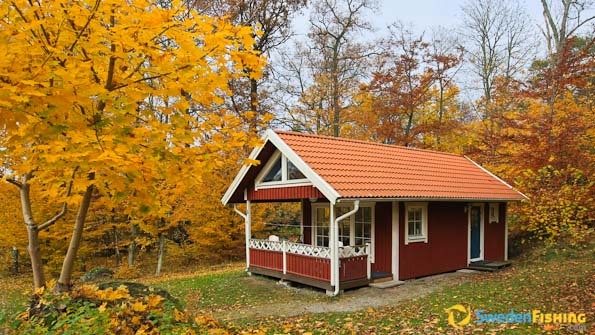 We can also rent out cabins close to the sea, but outside our cabin village. 170 km from Malmö Öresund Bridge//170 km from the Trelleborg Ferry Terminal//50 km from the Karlskrona Ferry Terminal//We’re located in the middle of the Blekinge between Ronneby and Karlhamn in the Järnavik Archipelago.